The Adventures of Paul, Sadie and Daisy Moo too! Our blog which is now focusing on our travels in Europe and the winter in Portugal. 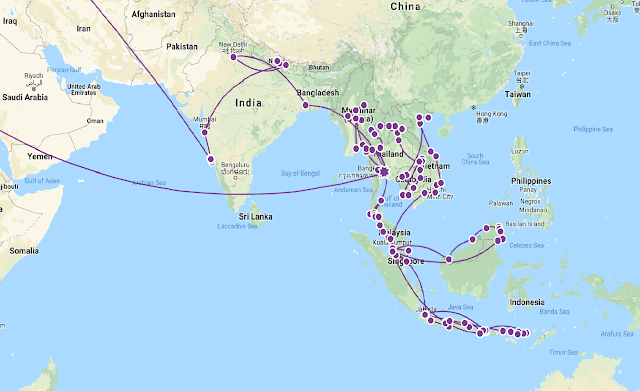 It also has all our adventures from travelling India and South East Asia in 2018. Our journey to Trang was just by an uneventful minivan. It took 3hrs and for some unknown reason even though they go past where you want to get off (the train station), they say they must drop you at the bus terminal that’s 4k outside of town. A short tuk tuk journey back and we arrived at our next guesthouse called Mittree. It was another aircon cave with no windows and a foul-smelling bathroom but it had a comfy bed and the guesthouse is perfectly located next to the station. After a quick cool down and change, we were out to investigate the town. First stop was a craft beer place Paul had found for me just round the corner called 92 bar & studio (the studio being a tattoo parlour upstairs). They had a great choice of beers, all sadly expensive but I had a very nice Coconut Cream ale and Paul had a Chang lager and we sipped these in the cool bar surrounded by film paraphernalia, quirky board games, arty skateboards and listening to David Bowie and the like blaring from the speakers. We’d read that there was a night market next to the station that night so headed back that way and found a sign for a rooftop bar which was too good to ignore. Up half a dozen flights of stairs you come out to a two-level rooftop area, with great views over the city to mountains. They had wickedly expensive Belgium/ craft beers but ok priced Singha lager and we watched the half obscured sunset whilst listening to cheesy pop tunes on the radio and nibbling an odd assortment beer snack of deep fried anchovies, chilies and peanuts. 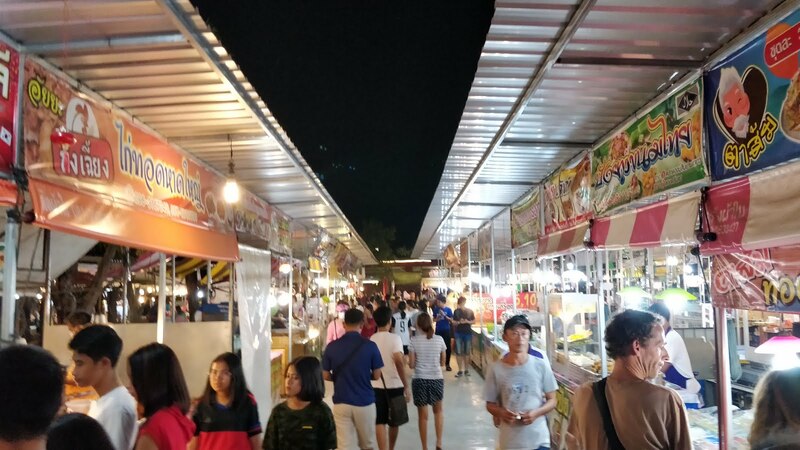 The night market was a crazy little place that sold an assortment of yummy food and we snacked on sushi, fried chicken, strange seafood batter balls and sorbet. We then got roped into answering some questions from a group of Thai students on tourism in Trang before hitting one final quirky craft beer place then bed. 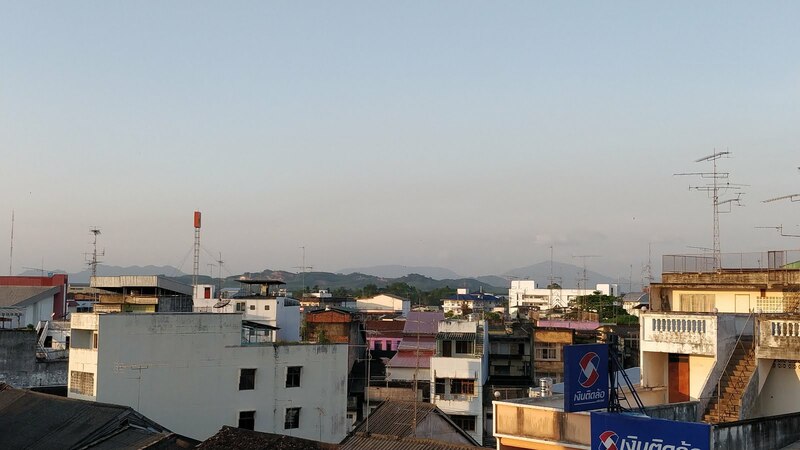 The next day we didn’t do much, but we wandered around town a bit more, found a place selling the Trang speciality of Dim Sum and then I found some beautiful purple hair dye! That was me sorted for the afternoon and one purple/blue coloured Sadie emerged later to sort out transport tickets for the next day. They were slightly more expensive than we anticipated but it was a hotel pickup, bus and ferry combined ticket so it took the stress out of getting places and buying tickets on the door. 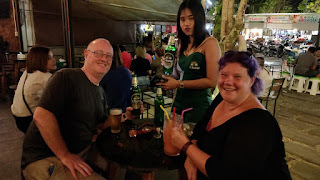 A beer at a lovely bistro in the old town and then back to the restaurant we were at earlier for roast Belly pork (another Trang speciality) and some green curry rice (that was slightly too spicy). 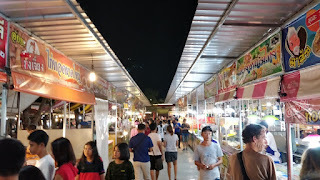 We then walked to the Cinta night market, a huge sprawling market selling everything from clothes, gadgets, cheap cocktails and food - A stage area had a band singing catchy pop tunes and at one end there are a few shipping containers set up as bars selling cheap beer. We wandered around, gazing at all the fascinating food getting prepared, there aren't many signs in English here so you have to guess what food is or if you loiter long enough they will smile and babble away happily in Thai. We recognised crickets and some sort of grubs but weren't hungry surprisingly! We finally settled in a pirate themed bar for more beers and a weird pink slush-puppy jug that she said had alcohol in although you couldn't taste it, but it made a nice change from beer. Feeling a bit tipsy we walked home and fell into bed – I had decided I really loved Trang. Urgh. The next morning was slightly painful. Why did we drink the day before an early start and a long traveling day! We hadn't packed the night before and with the taxi arriving at 9am we had a rush pack then breakfast before jumping into a packed minivan heading for Satun. As with all the other combination tickets we have got this trip, what you think you are doing is not normally the case but you end up in the right place. So, one minivan full of tourists took us most of the way, then we swapped to another minivan full of locals, then to a songthaew that took us to the port. We were over 3hrs early for our ferry but the important thing is we were there! We wasted a few hours sitting in the draft of some fans and then made our way through immigration to our boat – which weirdly looked like an airplane and had no outside seating / standing area. 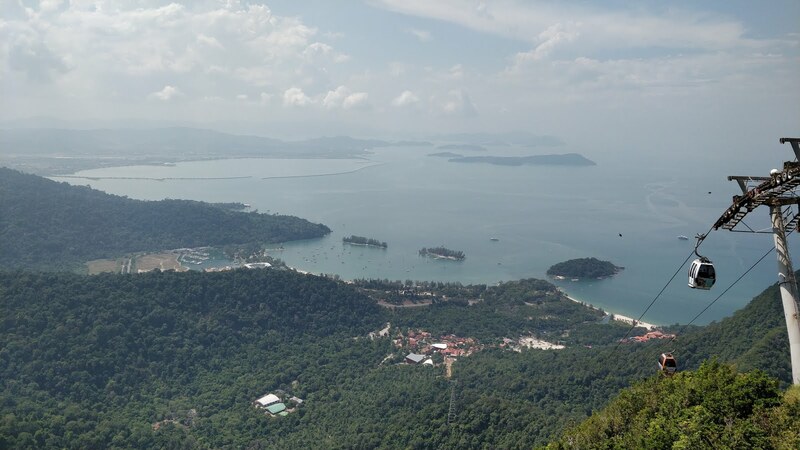 I was glad it was a short trip and just over an hour later we arrived at Langkawi, Malaysia. As you come out of the port it is with a mixture of disappointment and relief that you greet the Macdonald’s, Starbucks, and other familiar well-known shop signs before you follow your taxi driver to his car. We drove 30 mins to a guesthouse /hostel in Cenang that I’d spotted on trip advisor, called Soluna. It was highly rated, cheap and looked very pretty and we weren’t disappointed. It’s nestled back from the beach and surrounded by fields with chickens and cows wandering about. The hostel has its own 9 cats living there, which you are under strict instruction not to feed as they already have meals provided and they have a large communal fridge, cooking, seating area and central garden. 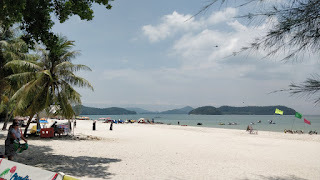 The beach is a 5 min walk down a road lined with other basic but cosy looking hostels and the whole place had a very chilled laidback atmosphere. 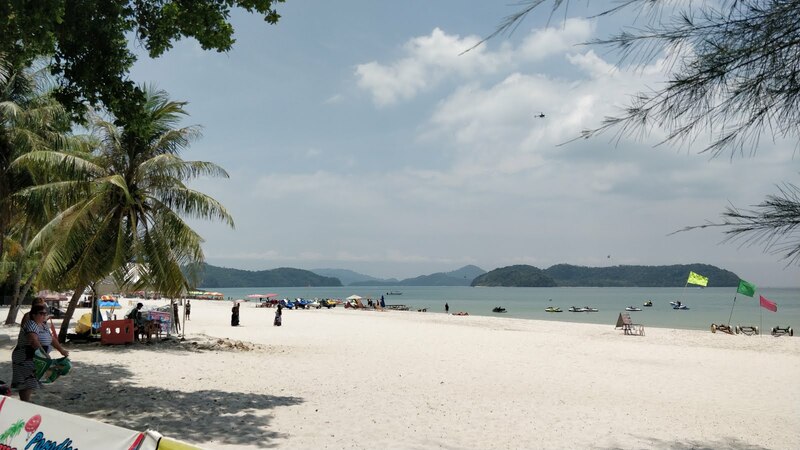 Langkawi is a duty free and a predominately Muslim island, this causes problems when trying to buy a couple of beers for the room as most of the local shops don’t sell it but if you bring your passport out you can take crates away from a duty-free shop…. tomorrow we must remember our passports. One of the things to do here is to join all the other tourists and go up the cable car on Mt Machinchang. It's the steepest cable car in the world and takes you up 708m above sea level. They have also built a horrid tourist Oriental Village at the base which sells plastic toys, t-shirts and other overpriced junk and adds attractions like a 6D cinema experience, or a 3D art museum – all for extra money at the ticket booth of course. 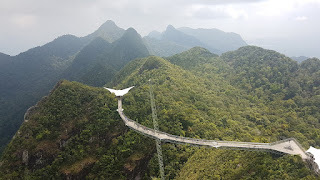 We decided to embrace it all though and got combo tickets for SkyCab (the cable car), Sky 3D art, Skyrex (a simulator set in Jurassic Park), Sky 6D and Sky Dome which was about £30 for us both. The actual cable car ride is definitely worth a visit and the views on the way up are amazing. 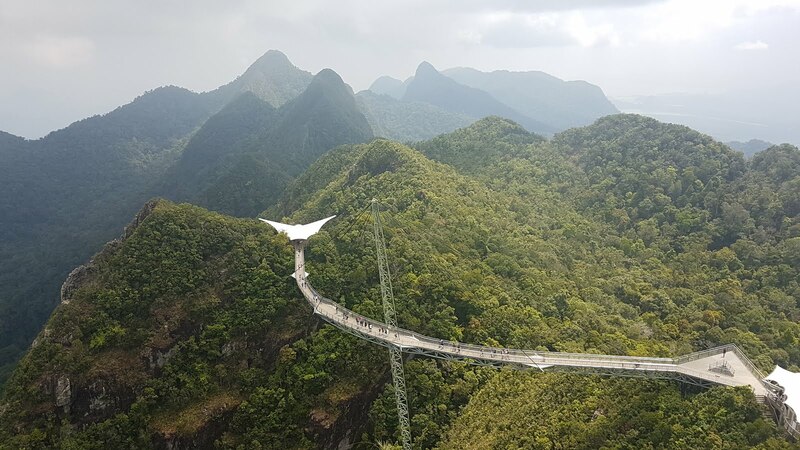 Once at the top you can pay another £3 each to walk the Sky bridge – a single pylon curved suspension bridge that hangs 100m above the ground and offers more beautiful views when not covered in cloud mist. The journey down in the cable car is slightly terrifying as our cable car seemed to slow down and stop a few times on the steepest bit and you can feel and watch the cable cars both sides sway, rise and fall with the slack on the cable. Quite unnerving! Of the other attractions the only one that is any good is the 3D art exhibition which was great fun and included a 3D mapping show which was quite cool. The 6D cinema was a shaky seat in a 3D cinema which gave me a headache and was not 6D at all, the Skydome was closed for refurb and the Skyrex was just an ok 3D simulator ride but in general we had a great day out here. During our time here, we ate some delicious food, sunk in the softest white sand beach, read books and dozed in the fan cooled communal area of our guesthouse, attempted Tanoura dancing in an Arabic restaurant and generally had an amazing time. I really wish we'd stayed here longer.